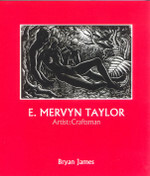 Comprehensive research into E. Mervyn Taylor’s life and art is presented intelligently and provocatively, and showcased with abundant photographs and images, many previously unpublished. It is a richly illustrated biography of NZ’s greatest wood engraver – an artist who received international recognition in 1950 when he was elected a Member f the Society of Illustrators, New York, held a solo exhibition at the Museum of Natural History, New York, and in 1957 exhibited at the International Biennale of Prints, Tokyo. In 1958, 102 works toured the USSR at the invitation of the Ministry of Culture. Now, this modest artist, whose illustrations in the School Journals made his art familiar to many, can continue to delight and inspire future generations. Available in hardback only, this book contains more than 300 images within its 160 pages, 16 of which are in full colour.